Valeria Sarmiento's Linhas de Wellington / As Linhas de Torres Vedras / Lines of Wellington (2012), set in 1810 during the Napoleonic wars, shows the mass upheaval across Portugal, as Anglo-British military forces led by Arthur Wellesley, Viscount Wellington (1769-1852),* are falling back to the Lines of Torres Vedras. 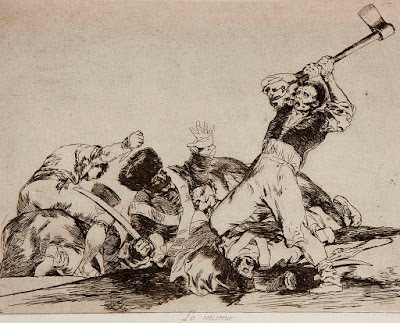 Practically the entire civilian population is fleeing with them before the advancing invasion forces led by André Masséna (1758-1817), Maréchal de France. The natural landscape, meanwhile, is laid to waste. 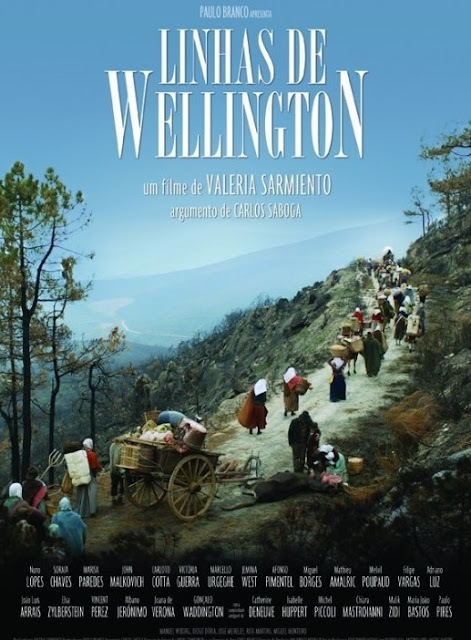 As a film (and mini-series), Linhas de Wellington was a labor of love, in that Valeria Sarmiento completed this project that Raúl Ruiz (1941-2011), her husband, was working on when he died. Ruiz had earlier directed a lavishly appointed adaptation of Marcel Proust's Le Temps retrouvé / Time Regained in 1999; this Napoleonic era film has similarly impressive period details set across the entire socio-economic spectrum. 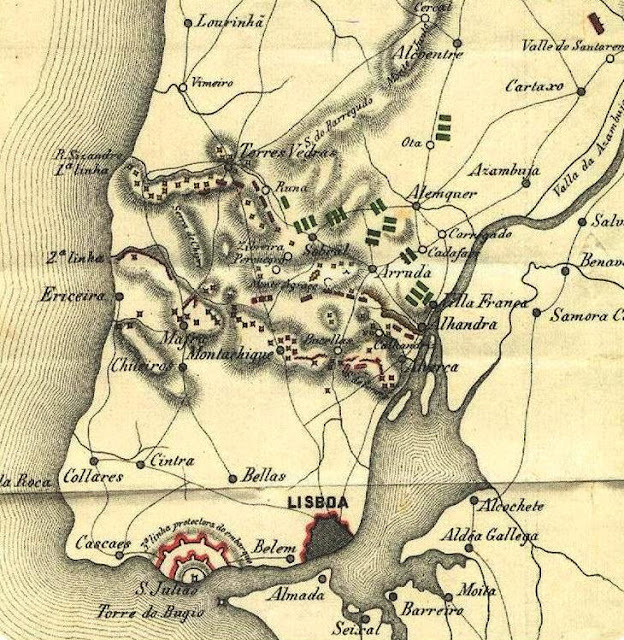 Linhas de Wellington begins on September 27, 1810, just as the Battle of Buçaco is ending, with scavengers picking over the dead and wounded. 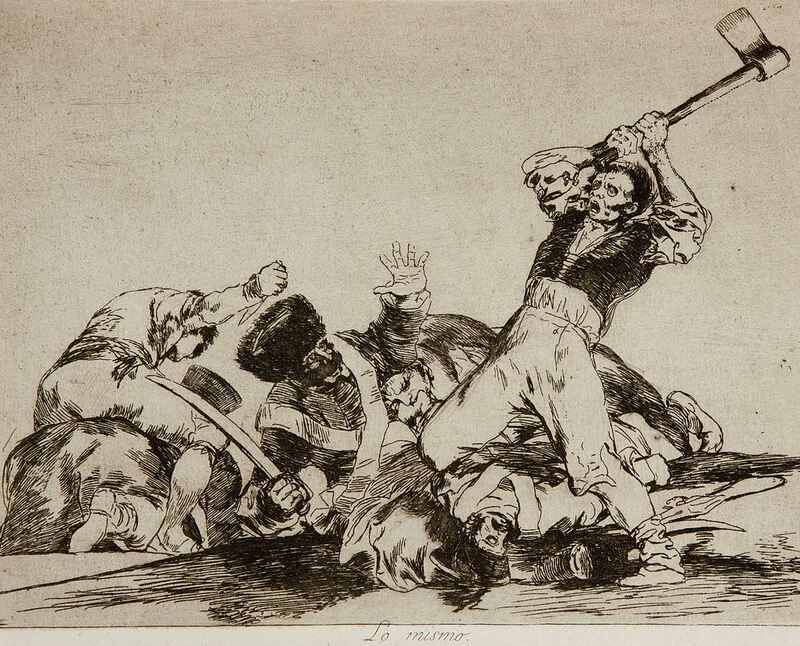 Linhas de Wellington often takes on the look and feel of a Goya print, such as this one from Los Desastres de la Guerra series: depicting people in hideous situations, committing savage acts, and victims of such acts. Linhas de Wellington also has good gender balance for a war movie: fans of Jane Austen will find multiple mini-dalliances and plenty of interesting social manners on parade despite the wastelands of war. Here, Masséna and his paramour (dressed in a hussar's uniform) consider new temporary quarters among the French officer corps. Today's Rune: Signals. *Not yet the 1st Duke of Wellington; that title would date from 1814. Played by John Malkovich. So much destruction wrought by war. Really intriguing story. Thanks for sharing!